A simple pair of cubic zirconia stud earrings, made with the princess cut and held in a four-claw setting and crafted in 9ct White Gold for an easy styling option that has become the essential piece of many jewellery collections. 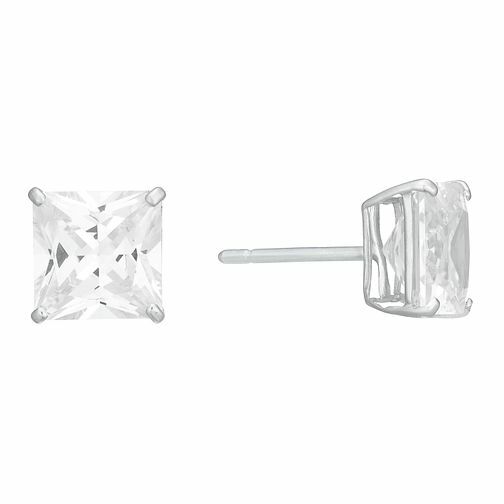 9ct White Gold 7mm Princess Cut Cubic Zirconia Earrings is rated 1.0 out of 5 by 1. Rated 1 out of 5 by Anonymous from stud earings The quality is vey low. The metal used for the part that goes through your ear was easily bent and actually arrived bent. Very cheap material used in the making of this product. Feel very cheated..